Talia: Explain what your project means to you! 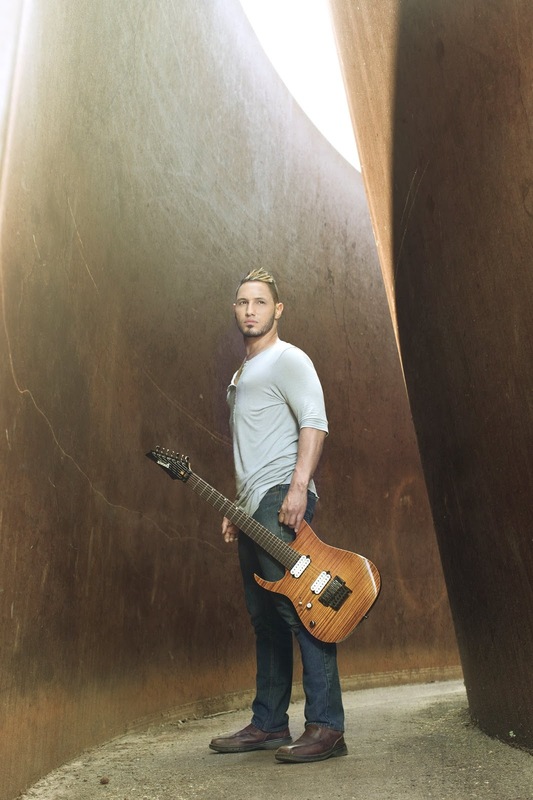 What is Angel Vivaldi? Angel: More "who" is Angel Vivaldi, really! It's my artistic platform where I'm able to musically express myself and say anything that's going on inside. Talia: When did you start playing guitar? Angel: I started about 15 years ago as I was just entering high school. Talia: What was the first guitar you started out with? Angel: It was an old broken down acoustic guitar a friend gave to me. Definitely the most beautiful gift; changed my life! Talia: Who are your biggest influences? Angel: Guitar wise Mattias Eklundh, hands down. Musically so many- Jean Luc Ponty, old school Children of Bodom, Evergrey, Kaki King, Parkway Drive (Horizons only, unfortunately), Preston Reed, Dance Gavin Dance. List goes on. Talia: I know you're sponsored with Dunlop, what awesome things have they done to help you so far? Angel: They're such a legendary brand who's been responsible for some timeless products. The MXR pedal line speaks for itself, but for me it's all about their picks. Nothing is more comfortable than a Jazz III. Talia: Are you sponsored with anyone else? Angel: I currently am endorsed by Ibanez guitars, Mesa Boogie amps, Dimarzio pickups, Kiesel acoustics, Fractal Audio and Dunlop. Talia: I notice you use Ibanez guitars, what made you choose to use that specific brand and why? Angel: Ibanez has always retained a special place in my heart for many reasons. It was the first decent guitar I had growing up and seeing all of my heroes play them was very inspirational! Talia: Do you have a specific dream guitar/who would you want it made by? Angel: Luckily for me I own it already. Talia: Tube amp or solid state? Why? Angel: I like both equally for different reasons. Tube because it sounds best, solid state because it sometimes just feels great to play! Definitely more forgiving at times than some tube amps I've played. Talia: Do you regret ever selling any gear? Which item was the biggest regret? Angel: Not particularly. I've never been much of a gear hoarder. Once I found Dorothy, my main Ibanez, I've been pretty monogamous...for the most part (laughs). Talia: Is there a specific pedal you prefer over an FX process? Angel: The new Dunlop 5150 pedal is absolutely out of this world. So incredibly impressed with it. Talia: Favorite piece of equipment? Angel: My main Ibanez Dorothy, which is a rare Ibanez Rg7 CT.
Talia: I know you use Dunlop's Super Bright Guitar strings, what makes you stick to those? Angel: They can take a pounding on tour and still sound and feel new. It's in my opinion one of the best 7 string sets I've played to date. Talia: You also use the Primetone Jazz III picks, why those and how long do they last you? Angel: I used those for a while, but always find myself switching back to the Ultez Jazz III's. Talia: Do you have a favorite type of wood? What makes it best for you? Angel: As a lead guitarist, I'm a huge fan of basswood because it cuts through a mix beautifully. Talia: I'm pretty sure you use DiMarzio's, why them of all other pickups? Which specific pickup is your favorite and why? Angel: I've been experimenting more and more with different Dimarzio pickups. The latest set I've been using are the Illuminators and find they offer a rich harmonic balance in mahogany guitars. At first it was a bit snappy for my tastes, but I'm starting to really enjoy how it responds. Talia: What advice do you have for any fans if anything? Talia: What's in store for you and the rest of the band? Angel: I'm re-releasing The Speed of Dark this spring which is incredibly exciting. Later this year you'll see a new Angel Vivaldi record with some other surprises!